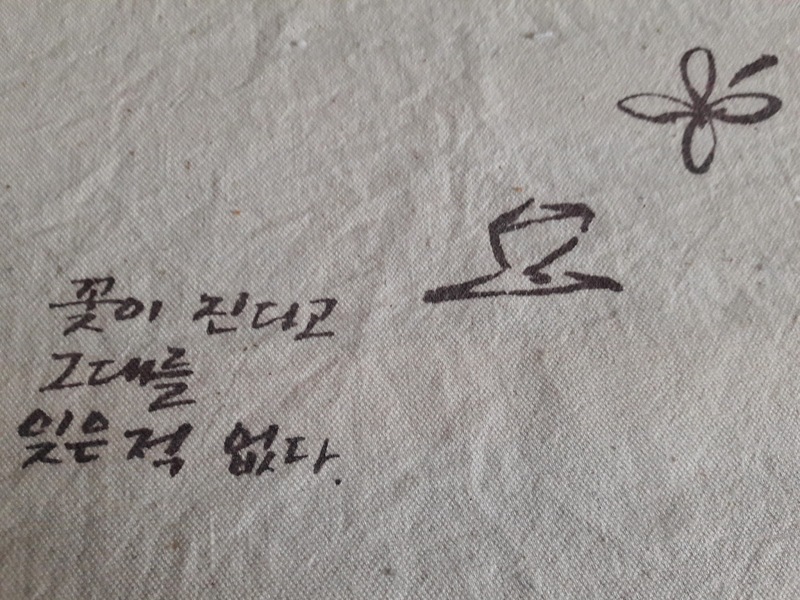 Thirteen years ago a Korean sister came to Oxford to study English. I was living in London at the time, but we met and became friends, bonding over the fact that we are twins, born within a few hours of each other. Throughout the past thirteen years we have maintained a sporadic contact, especially greeting each other on our shared milestone birthdays, and using the Society's post "by opportunity", whereby visiting or returning sisters arrive bearing cards and small gifts from one good friend to another. It's a lovely practice, which endures, even in this age of instant communication. 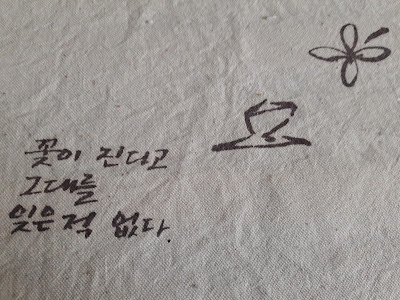 One gift from my twin was this cloth: I'm told the words say Even though the flower dies, I will still remember you. I fired back an immediate reply - how could we be in the same small city and not meet??? I sent phone numbers and suggestions, but, unknown to me, she was already travelling and had no internet access. So I waited, with diminishing hope, for a phone call or email. By lunchtime I was resigned to not seeing her, so when the doorbell rang I just assumed it was a parcel delivery or student's friend. So you can imagine my joy when I suddenly and unexpectedly found myself hugging my twin! She had left the group at the end of their talks and presentations and, recognising landmarks, somehow remembered the way to her former home. We had a too-brief time together before I walked her back to the coach stand, to rejoin her group as they returned from their brief tours of the city. How do you catch up on thirteen years in little more than thirty minutes? You don't; you can't. All you can do is savour every second of the joy of being with someone you love; savour the mutual love and affection and let the joyful memory of that remain in your heart. So we hugged and parted and I walked up St Giles, sad at the brevity but with a lingering joy reflected by the smile on my face. Our meeting and its burst of joy had been swift and sudden, but the gladness it brought me has endured. And we both know: even though we may never meet... even though the flower dies... my twin and I will remember each other.